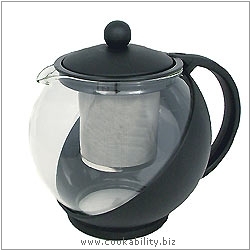 A 4 cup 1.1ltr glass teapot with removable stainless steel filter and smart black combined polycarbonate lid, handle and stand. Glass body and be removed for cleaning. Can be used hot and cold. Temperature safe to 120°C.